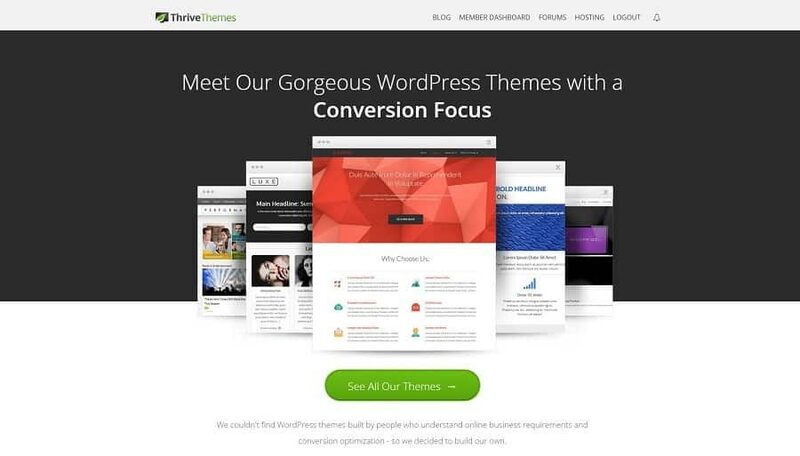 Why is Thrive Themes the ultimate go-to WordPress Theme? Why is it a must-have for your website? If you want to know if Thrive Themes is the best WordPress Theme for you then you’ll love this review. The team at EntreprenersGateway.com have been putting it through a rigorous test to provide you with the answers. Can Thrive Themes help to create you a beautiful looking website? Can Thrive Themes help turn your vision into a reality? The EntrepreneursGateway.com team reveals all! Thrive Themes is limited to WordPress CMS sites and it is difficult to modify old pages using the Thrive Themes builder which was only helpful for new posts or pages. Thrives prices are very reasonable and range from $19 per month for all Thrive Theme products and $67 for each individual purchase. Thrive is a simple and easy to use drag and drop editor with no need for multiple plug-ins. Thrive Themes support is really quite good. Customers can open support tickets via the private forums and the knowledge base is also packed with solutions to common issues that may arise. What exactly is Thrive Themes? 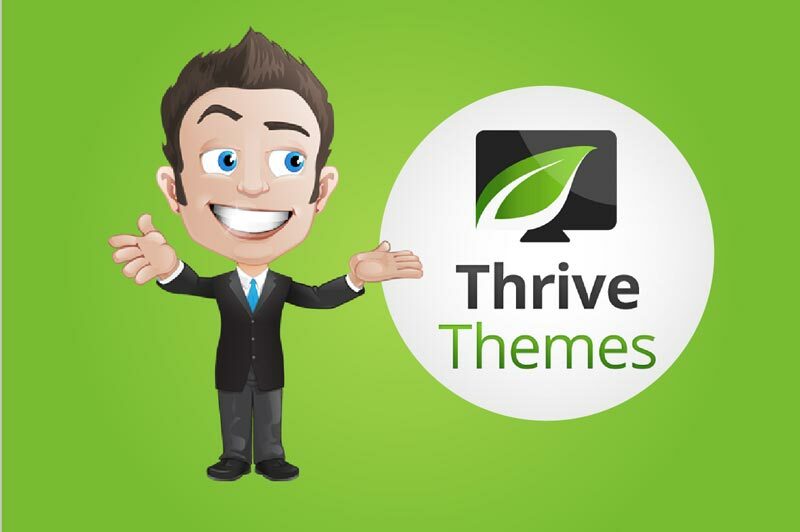 Thrive Themes is a set of WordPress plugins and themes, created by Shane Melaugh (the creator of SE Cockpit, Hybrid Connect, as well as the blogger for ActiveGrowth) and, rated TOP in my review of the 8 Best WordPress themes. For you to create an effective website, Thrive Themes offers a selection of themes and WordPress plugins, plus additional resources. Whatever your goals, these products are aimed at helping you gain the highest rates of conversion for your website. Which is something we ALL strive for! Thrive Themes has all the tools that you could want, whether you’re a service provider, affiliate marketer, product supplier or merely a blogger looking to interact more effectively with their audience. Although costs will be covered towards the end of the reviews, I’ll quickly mention now that the products can be bought individually, or by joining the membership programme- access is automatically granted to all of them. This review looks at Thrive Themes best products, and whether they are the most suitable tools for both you, and your website. I will share my experience with you as I use Thrive, together with all the things I like and dislike. In this section, we’ll understand just how easy Thrive Themes is to set up and use. Simplicity really is key when it comes to choosing the eight WordPress Theme for you. Never having to worry about learning one piece of code, are their layouts and designs easy to use and how customizable are they? So, let’s get one thing straight. 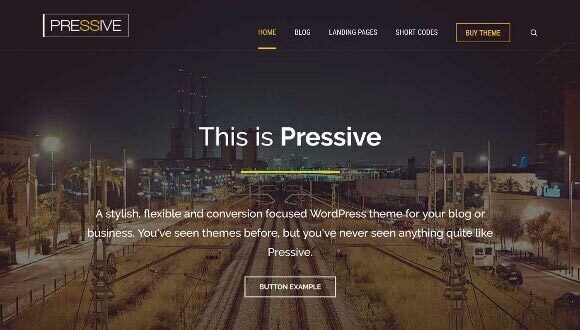 You may not be familiar with Thrive Themes or perhaps not even heard of it before but allow me to tell you this: Thrive Themes is a premium and powerful WordPress theme that is taking the market by storm fast and hard. I have reviewed several premium themes and have found Thrive Themes to be one of the most versatile themes I have used. Thrive has an exceptionally unique point of sale, in that they brand their products as being conversion focused, in other words, every option within Thrive Themes is heavily focused on converting blog visitors into subscribers. 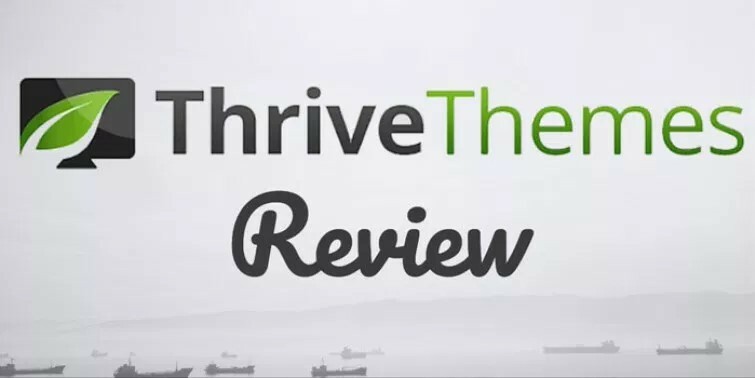 Check out the Definitive Review & Tutorial for #ThriveThemes #WordPress #Theme and take action to create an effective website! Click ‘Activate’ – tah dah!! 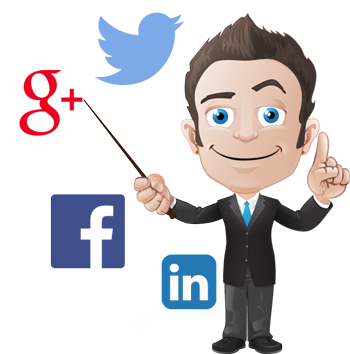 You have now successfully installed Thrive Themes – job done!! What I love best about Thrive is that everything is more or less done for you – all you need to do is to add the content and (if you choose) to split test. Easy access to the forum, tutorials and training. What I totally LOVE about Thrive is that I am able to customize a theme without having to know a single line of code – RESULT!! Of course, for those who may wish to add their own personal touches to the site, then CSS can easily be added to the theme. Having used other premium WordPress Themes, generally, there are ‘demands’ expected when marketing them. For example, there is the requirement for flexibility, usability, uniqueness and easy navigation, the great thing is, with Thrive Themes EVERYTHING is all in one place, all under one roof, from pop up boxes to social media share buttons – all with just a few clicks of the button. Believe me when I say that with Thrive Themes, the only obstacle you are likely to face is your imagination. 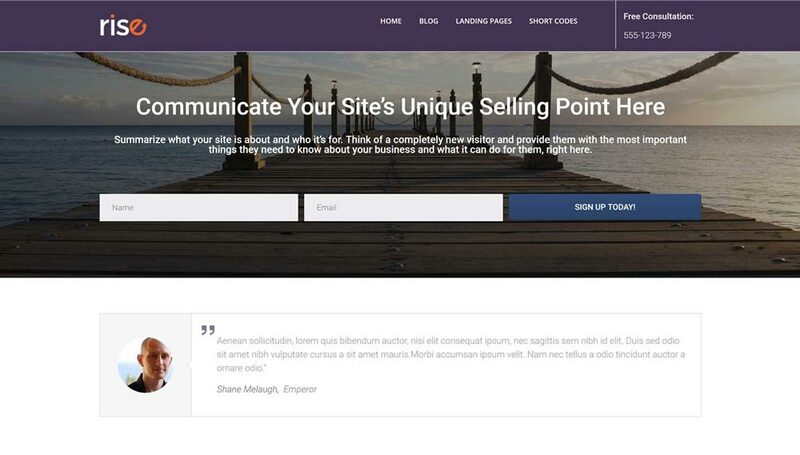 Thrive Themes offers shed loads of templates which can be used to build out pages and posts. And, if like me, you’re not completely sure how you want your webpage built, then there a plenty of designs and prebuilt pages that the themes of Thrive have to offer. Even better, is that the themes are totally customizable as far as the editing of content within the pre-built page is concerned. The layout design of posts and web pages is made so simple by Thrives drag and drop editing. What I love about this is that you can see in REAL TIME how your webpage is looking. Which means no more previewing of posts to see whether they look good- big thumbs up Thrive!! Now, I will be covering the thrive architect plugin further on in this review but thought that I would briefly touch on some of the unique features that it offers such as countdown timers for exclusive offers and very eye catching call to action buttons. I must admit though, the timer is a fab feature, for those who want their visitors to urgently take action. What Thrive Architect does is allow you to create designs to your specifications and not to be stuck with predesigned themes. Right, let’s move onto the features that Thrive Themes has to offer. Choose a WordPress Theme that is jammed packed with features to guarantee the perfect website for you and your customers. You’re reading an amazing article on your mobile device and then IT happens, the social share buttons continually begin to pop up in the middle of the article, often resulting you being driven nuts and never finishing it. Would you want your site to be that annoying for your readers? You probably already know but over the last two years, for most niches, mobile traffic outpaces desktop traffic. 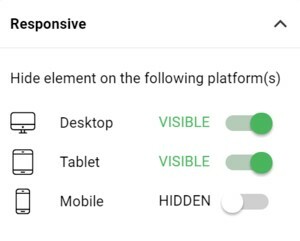 Now, because of this, Google is basically pushing the webmasters to ensure that their sites are completely mobile-friendly. Also, sites that are the most mobile-friendly witness higher conversions. ALL of Thrives themes are completely responsive (breathes a sigh of relief). 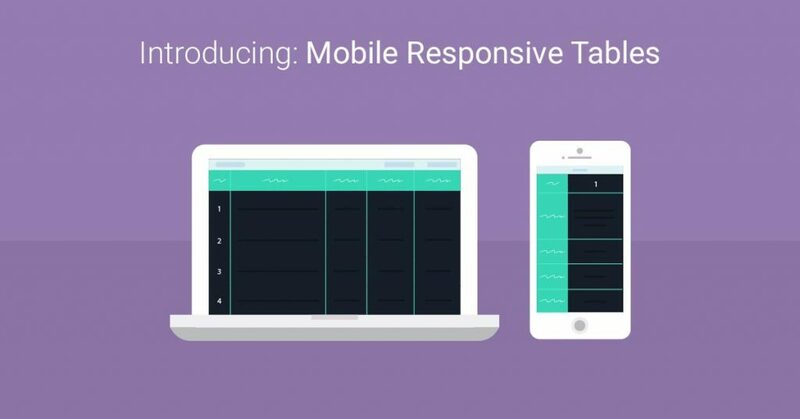 This means that you need never worry about your site being unresponsive. All the elements scale up beautifully to match any device’s screen size. If the content has multiple columns, then when the site is loaded onto a mobile device (with a narrow screen), the columns will stack on top of each other. Also because the font sizes are responsive, the typography of your site when viewed on mobile devices won’t be sacrificed. In the past, Thrive did have issues with their incompatibility with mobile browsers, but it seems abundantly clear that they have updated and corrected this with their new infrastructure. 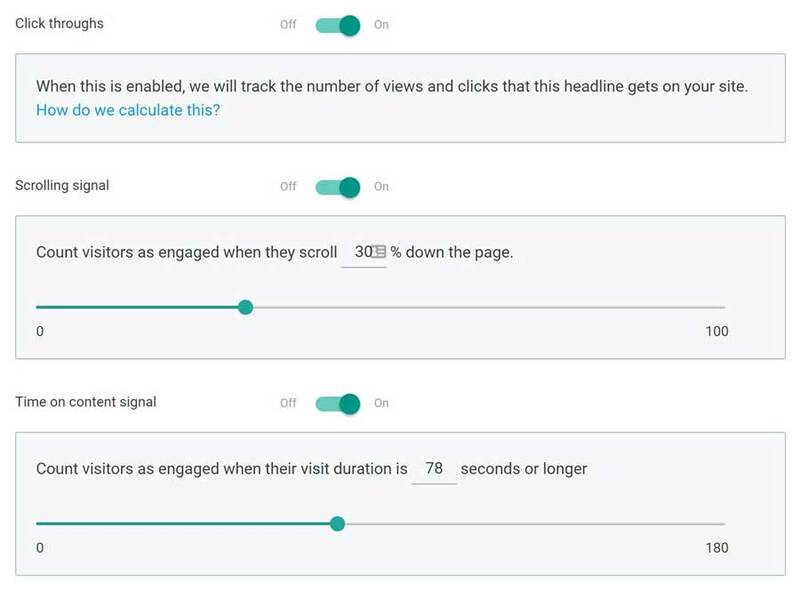 Thrive Architect also allows you to check the appearance of your pages through a mobile device, which I think is so important as nine times out of ten, people are reading most of their content through these. Loading oversized images all over the place can really slow a website down. Ideally, the image size should be the maximum that it will ever be shown at. For example, if an image was 400px wide on a desktop screen, then the image file should ideally no wider than 400px. When using Thrive Architect, you are able to toggle the visibility of elements for various screen sizes. It’s a really easy change that is able to be applied to all elements as well as entire parts of your page. This is the most important tip which you need to know for mobile-friendly editing. It’s the most specific to Thrive Architect, because, as far as I am aware, no other editors for WordPress offer responsive editing at this detail. 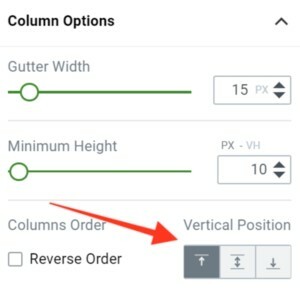 The rule is: anything that is changed in the sidebar options of Thrive Architect IS mobile responsive, meaning sidebar settings can be changed for specific screen sizes. Text can be center, left or right aligned. The same principle is also applicable to other elements. Always consider the “max width” option first, instead of adding large side margins or padding. 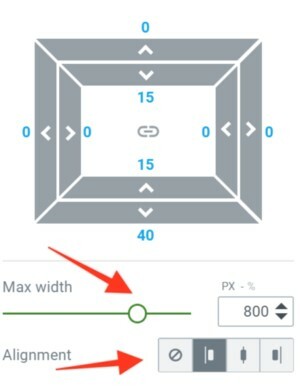 By using the max width settings, you are able to alter the alignment and width of any element. 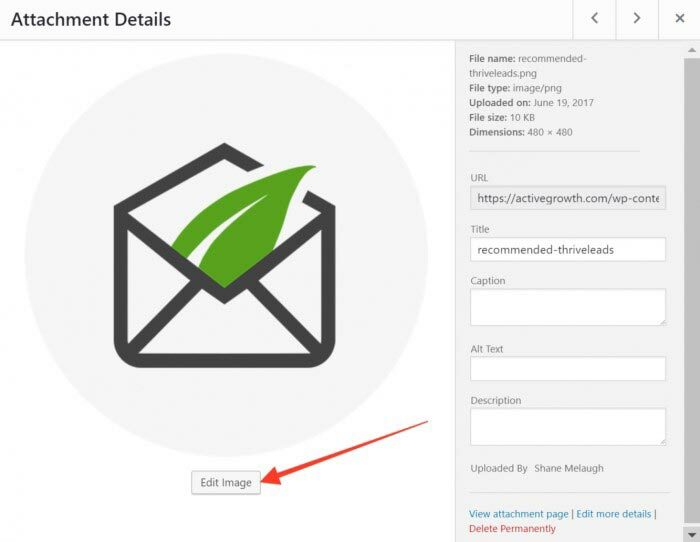 When using Thrive Architect, images can be added to text content and the text can then be wrapped around the image. Text wrapping around images does look good on bigger screens, but it can result in text being squeezed into narrow spaces beside the image, when using a smaller screen. A good workflow is by building content on the biggest screen size until everything is completed – then, switch to the view in tablet form. When the view is changed there shouldn’t be many amendments as everything is responsive by default. After making any adjustments in the tablet view, switch to phone view. Again, you will probably have some minor tweaking and adjusting to do. Once done, this means that the page is completed and will look great on any screen size. 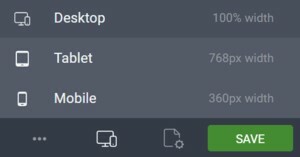 The only exception to the “desktop to phone” workflow is that prior to duplicating an element for reuse on your page, check it across all screen sizes and make any necessary adjustments. By doing it this way, the duplicate of the element will be mobile-friendly which then means you won’t have to repeat the same work. Thrive Themes contains several WordPress plugins within their portfolio. These help generate more leads, enhance content, interact more effectively with your audience, and personalize your website. Listed below are the included plugins, when purchasing a Thrive Themes membership. Thrive Quiz Builder– this tool creates quizzes for your sites – and more! It’s probably best to begin, by looking in detail at the most outstanding plugins, together with information about the other tools available. For those of you that aren’t in the know, Thrive Architect was formerly known as Thrive Content Builder. It serves the same purpose as its predecessor, the only difference being that Thrive Architect has been completely recoded. Where exactly does this new product fit in? Let’s start with the 10 reasons why Thrive Architect is so good. These days, more and more people use their mobile phones, rather than a desktop. With Thrive Architect, it’s easy to design different layouts, on different sized devices. Text and images etc. can be reformatted quickly to mobile devices, without affecting the desktop version. Software upgrades can cause downtime, which is not a pleasant experience. Traffic and revenue can be lost due to a site going down as a result of incompatibility issues. For those generating traffic via SEO, this can have a huge impact on rankings. With Thrive Architect, however, this is unlikely to occur. 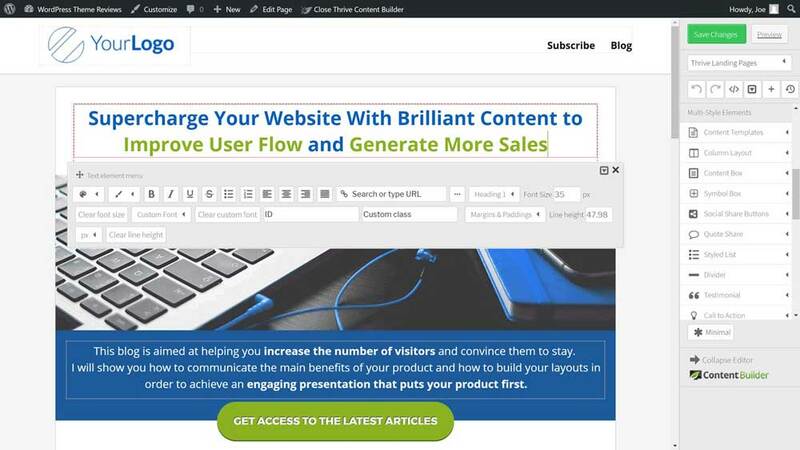 You’ll be glad to know that if all your sites and web pages have been created with Thrive Content Builder, you won’t need to recreate or edit them again. 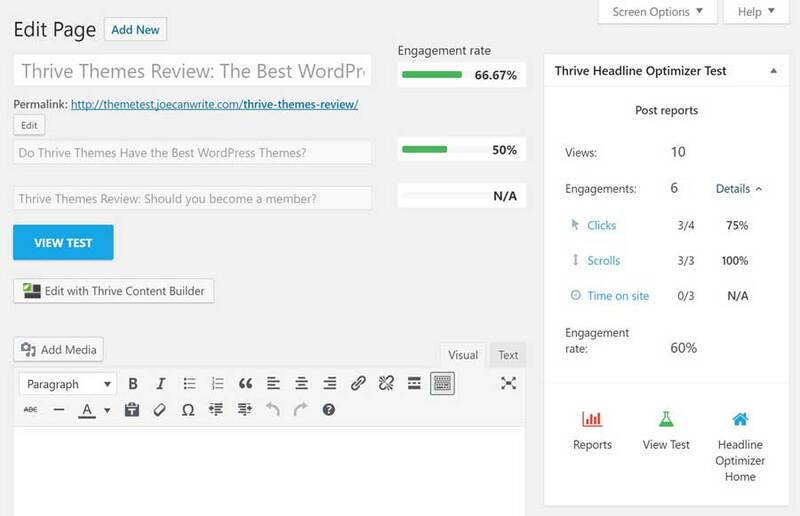 A few clicks ensure that your Thrive Content elements are updated to the Thrive Architect element. It’s magic! Don’t worry if you’re not a designer, Thrive Architect has loads of highly converting templates to get you started. The great thing about Thrive Architect is that it has a WYSIWYG interface. This means any editing done on the front end is immediately reflected when the save and publish button is clicked. Editable content on Thrive Architect is referred to as an element. These elements can be swiftly moved and adjusted, according to where you want them. If you find you are repeating and recreating the same content on your website, you can now create content templates to save time. 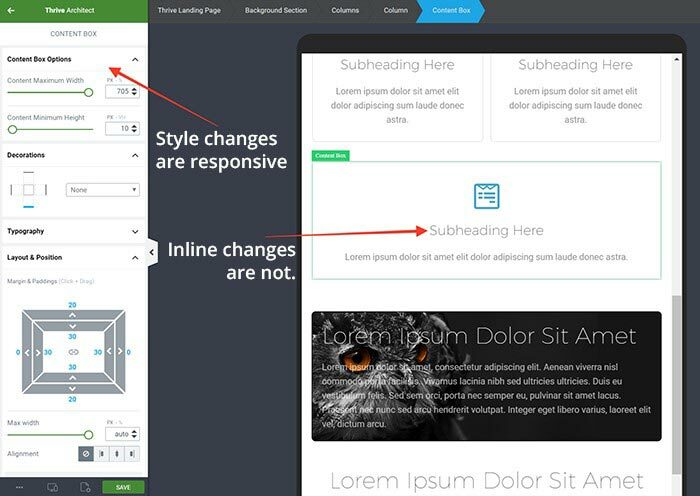 In Thrive Content builder, it could be difficult to align elements and images on all devices. Now, however, Thrive Architect makes it simple to create the correct padding and margins for all devices. The plugin Thrive Leads, is an easy, yet powerful, lead generation tool, which primarily aims to help capture those yearned for email subscribers. Slow websites can have a negative impact on how your website ranks. Fortunately, Thrive Architect keeps speed in mind, meaning users can’t fail to notice how quick it is. A WordPress plugin is very practical, in that once you pay for it, it’s on your website, under your control. You can effortlessly edit on your WordPress site, with no need to worry about logging in to different sites or issues with integration. WordPress plugins allow the use of your domain, rather than a subdomain, helping influence whatever SEO authority is on your site. Thrive Architect allows you to create customized WordPress pages and posts via a drag-and-drop user interface. The options available are pre-built page sections/layouts, or to create your own design. When you open a page template, Thrive Architect interface lets you click on its items and element for editing. Once you have clicked on an item, context-sensitive controls appear in the sidebar. Remember, because this is a front-end builder, the page shows up as visitors’ will view it. Gone are the days of switching tabs to view every little change. This front-end builder development and design process is also responsive and fast. Regarding both functionality and creativity possibilities, Thrive Architect compares well against other leading page builder plugins, such as Visual Composer and Beaver Builder. However, Thrive Architect is more geared to creating landing pages and marketing content, due to its content modules and prebuilt page templates. It is a brilliant tool, but if you are looking to construct a broader range of website pages, then something like Divi Builder or Beaver Builder may be more suitable, due to the numerous template selections available. One of WordPress’ most powerful lead generation tools is Thrive Leads. 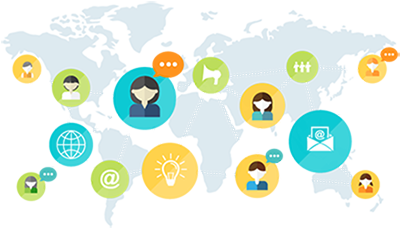 Thrive leads can prompt visitors towards desirable actions, help expand email lists, and help boost conversion rates. Thrive Leads’ main aim is to allow pop-ups on your website. These can contain text, videos, images, email opt-in forms and those all important, calls to action. By using Thrive Leads Editor, you have boss like control over the behavior and look of these pop-ups. The form and the pop-up content can be modified using the drag and drop interface. Choice of opt-in forms, including two-step opt-ins, pop ups, screen fillers, in-content forms, content lock and much more. Compared to other WordPress plugins like Bloom and OptinMonster, Thrive Leads is an excellent lead generation tool. According to the ‘Advertising Guru’ David Ogilvy, a headline will be read by five times as many people as will the body copy. Keeping this in mind, how essential is it to ensure that you grab readers right from the off. Make those blog post titles scream out- “READ ME”, followed by a guaranteed click through to the full article. 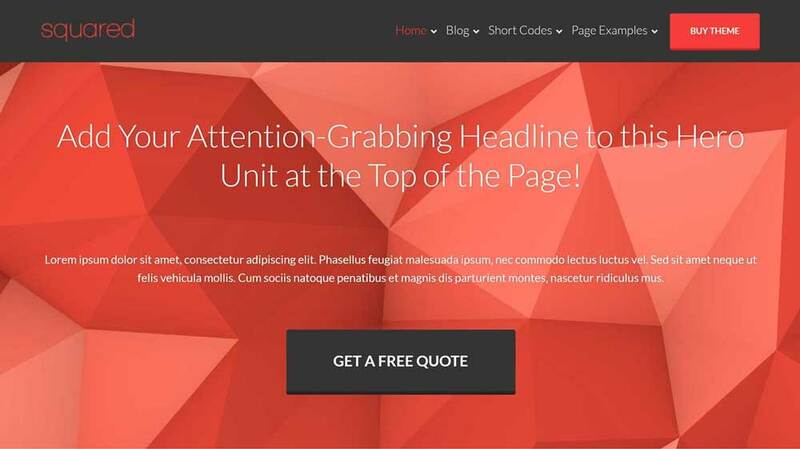 Thrive Headline Optimizer plugin goes above and beyond here, with its sole purpose to search for THE BEST, most effective title for that specific content. WOW, sign me up NOW! By using Thrive Headline Optimizer, you can test out multiple titles on pages and post to which produces the best audience response. The Headline Optimizer allows you to select several titles, in order to gauge best performance. By inputting selected titles, the optimization plugin displays the variations to site visitors and then tracks engagement levels to reveal a winner. The test criteria for every experiment can be modified and adjusted to how you want it measured. Thrive Headline Optimizer is a must if you want to know which titles engage readers and ultimately reduce the bounce rate. As I mentioned at the beginning of this review, all products mentioned can be either be purchased on their own, or by becoming a Thrive Themes member, accessed without extra charge. Tell Me Again What is Thrive Themes, WordPress Themes? The WordPress themes from Thrive Themes (it’s a bit of a mouthful I know !) cover a whole range of project types. However, the sole aim is primarily to help improve website conversion rates. For those with a specific target, whose site is centered around, these themes will be a good match for you. If you are looking for a blogging theme that can maximize conversions, then Rise is definitely for you. The fact that it was, allegedly built in partnership with a successful affiliate marketer, means that it more than delivers its goals. Rise, is a good option for those who are either planning on promoting their own products, or using affiliate links in their blog for monetization. As with other WordPress themes from Thrive Themes, the Focus Areas feature can be utilized to generate several opt-in forms or custom calls. 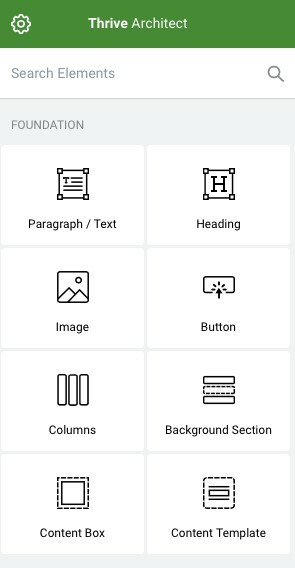 These will automatically display in the header and footer areas of your site, or if preferred, can be inserted into the content individually. The creation of Squared, was for the creation of business websites that were high-converting. Squared is suitable for those who are merely promoting their business, freelancer services or agency. Because of the page and post templates within Squared, it could also work well for blogs. Within Squared there are decent templates covering landing pages, sales and lead generation. These can all help to promote products, services, and any other offers your website may have. Price: From $19-$49 a month for all Thrive Themes products. Pressive was designed to create sales pages, marketing websites and conversion focused blogs. It was designed to provide the necessary tools to get the most out of your traffic. Price: From $19 or $49 a month for all Thrive Themes products. Thrive Themes customers can open support tickets via the private forums. This is an easy way to tackle issues that other users may have raised. The knowledge base is also packed with solutions to common issues that may arise. Each product comes with its own set of tutorials to ensure that you get the most from it. Included in the knowledge base are tutorials, documentation and troubleshooting tips. To stand out from the competition, and to substantiate their claims of being an all-in-one toolbox for online businesses, Thrive Themes also offer tutorials and webinar recordings, to help maximize your use, and enjoyment, of the tools for business growth. Thrive by Name, Thrive by Nurture. If that wasn’t enough, Thrive Themes also offer its university courses. 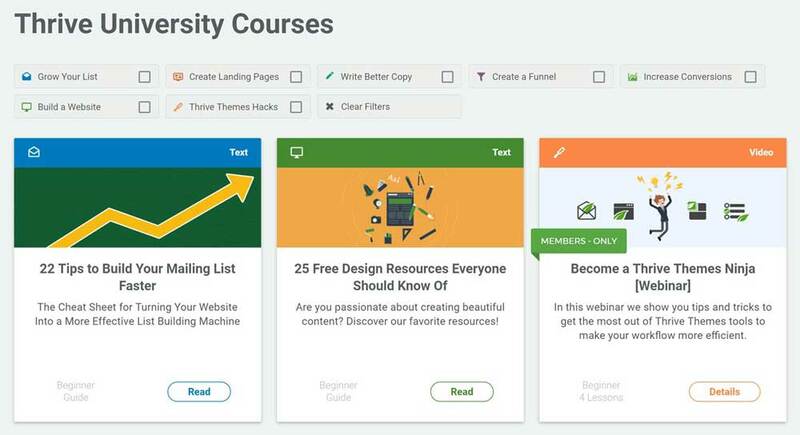 These courses cover a multitude of topics from designing influential opt-in forms, launching products, creating a conversion-focused website from nothing and creating webinar funnels. The teaching courses comprise several lessons, written content and videos too. If you’re looking to create a seriously effective website and hone those online marketing skills, a Thrive Theme member, you should be. This gives access to the university content, a serious cut above the rest! When it comes to investing in tools, Thrive Themes offers flexibility. You can either join the Thrive Theme membership programme, which gives an all areas pass, or alternatively buy the plug-ins and themes separately. When purchasing separately, there are several options available, dependant on the number of sites required for. Thrive Membership subscriptions are billed either annually or quarterly. For those that pay annually, a discount is offered. The membership covers the use of all plug-in and themes, on all websites owned by yourself. Access to product updates is included in all options. For individual products, one year of customer support is available, with the Thrive Membership, support access is unlimited. So, is the membership for Thrive Themes, really worth the money? $228 per year, may sound a lot for the Thrive Themes Membership, but take into consideration the Thrive leads plugin is the same price as you would pay for a comparable one like OptinMonster. 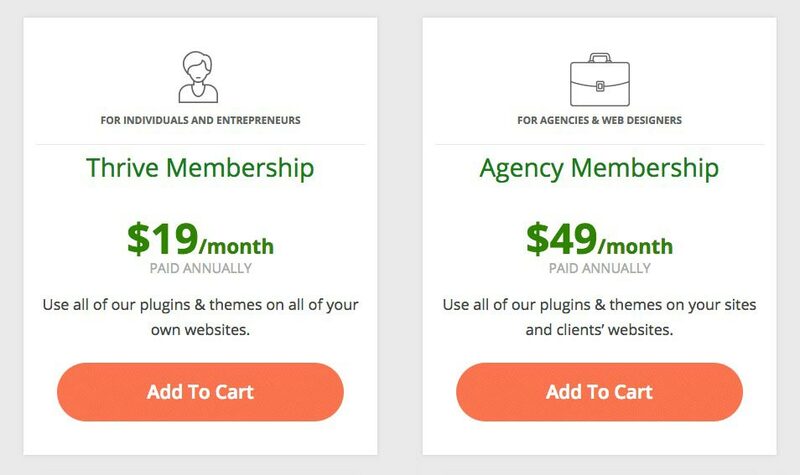 When comparing how many additional themes and plugins are included with the Thrive Themes membership, it begins to look like value for money. 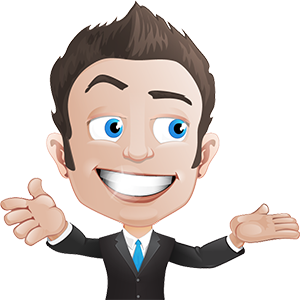 For those on a budget, (and who don’t need the powerful features included in Thrive Leads) but still want a premium lead generation plugin, and first-class theme, then affordable options are available. Both Divi theme and Bloom opt-in form plugin are good alternatives, and both available from Elegant Themes as part of the $89 all product package. Included with Divi, is a split testing tool, together with a very impressive page builder. Is Thrive the right Theme for You? I’ve covered most of the different functions and features of Thrive, listing all the likes and dislikes and sharing my experience with you along the way – it’s now down to you? As always with any theme, Thrive, isn’t for everyone. I’d like to outline who exactly this would be suitable for. Thrive, as a company, is known for being conscientious with its product pricing. Apart from their onetime costing, Thrive, also offers a membership option giving full access to their library of themes and plug-ins. The main thing that made Thrive stand out from the crowd is that they focus entirely on conversion. So not only are they making their themes look pretty, they are doing everything they can for the purpose of blog marketing! What I mean by that is that they understand a bloggers’ needs and have designed their themes for the purpose of leads which then generate sales. There are a lot of other WordPress themes out there that weren’t designed for this purpose. So a definite thumbs up here Thrive! The best part of using Thrive Themes is that your vision really can become reality. It enables those who may struggle creatively, to turn their ideas into actual landing pages, like funnels, opt-ins, webinars and much more. The Thrive Themes, drag-and-drop builder platform makes it easy to create content, whatever your creative level. The Thrive Themes target audience is those looking for a wide range of tools that will enable them to create a well-optimized website. The individual themes may not be overly impressive, but the combination of plugins, themes and education content, offered to Thrive Members, boosts the portfolio to the highest heights. 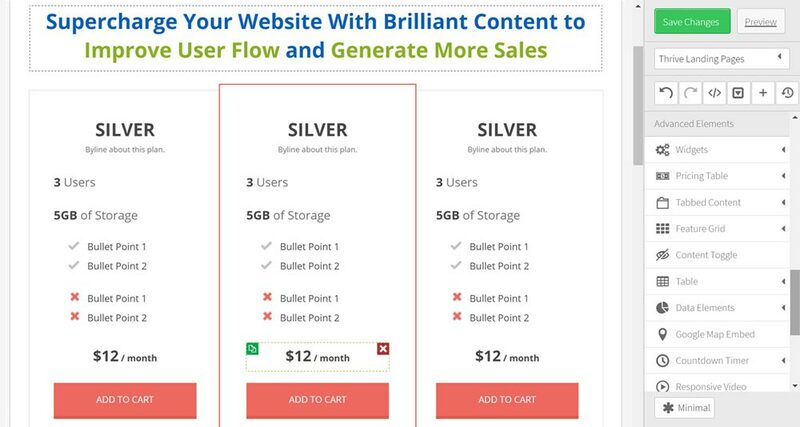 It could be possible to get similar results from the budget products within Elegant Themes, but the primary focus on conversion rate optimization, along with the educational content just won’t be there. By joining the Thrive Theme membership programme, individuals have unlimited access to the themes, content builder, lead generation tools and educational content. This combination makes for a fantastic foundation on which to build a business. 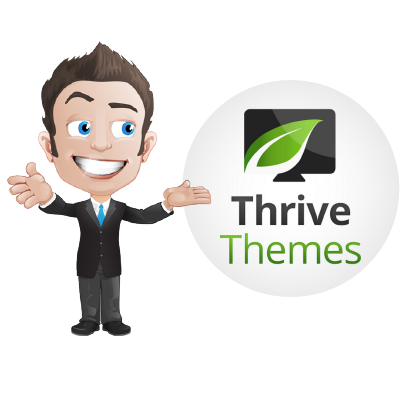 Are you going to purchase Thrive Themes or are you already using it? Perhaps you started reading review this with the intention to buy, and maybe now you’re not so sure! Feel free to leave a comment below and we can see if I can help…. or check out the other reviews like Genesis or ThemeIsle!